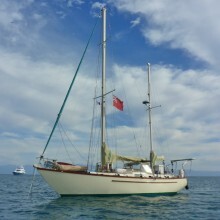 Im looking for crew to join me and my 44ft Bruce Roberts Ketch on a little adventure. I have spots available from end of may/early june 2019 sailing the Tuamotu islands in the south pacific and heading towards either Tahiti for November or north to Kiribati and potentially Hawaii. I will spend at least two seasons exploring the paradise of the South Pacific. I would like to get off the beaten track and intend to spend time in remote anchorages in between returning to civilisation for resupply etc. I am crossing the Pacific from Mid march so will be out of contact, but drop me a message here and I will get in touch once I have arrived in the Marquesas. I'm a water baby so there are a number of toys on board including paddle board and a dive compressor. I expect to spend a decent amount of time underwater (hopefully you'll be divers/freedivers as well) as well as hiking the islands and experiencing the rich, diverse cultures and meeting people. Boat descriptionWindarra was built in 1979 when they used fibreglass properly, as such she is a little weighty at 32000 lbs, but has an inch thick hull, is very stable and has a surprising turn of speed. Top side she is ketch rigged with a self tacking staysail on a hoyt boom. She has undergone an extensive refit since I bought her, including new engine, modernised the electrics, water maker, solar panels and other mod cons. She has a windvane installed, along with new liferaft, new EPIRB and Sat Phone. Below decks there are five berths with good bedding, two heads including a half bath, good sized saloon and galley with microwave and breadmaker. There is a TV and music system along with an extensive movie library and board games. She has a paddle board, new dinghy and is properly set up for diving.